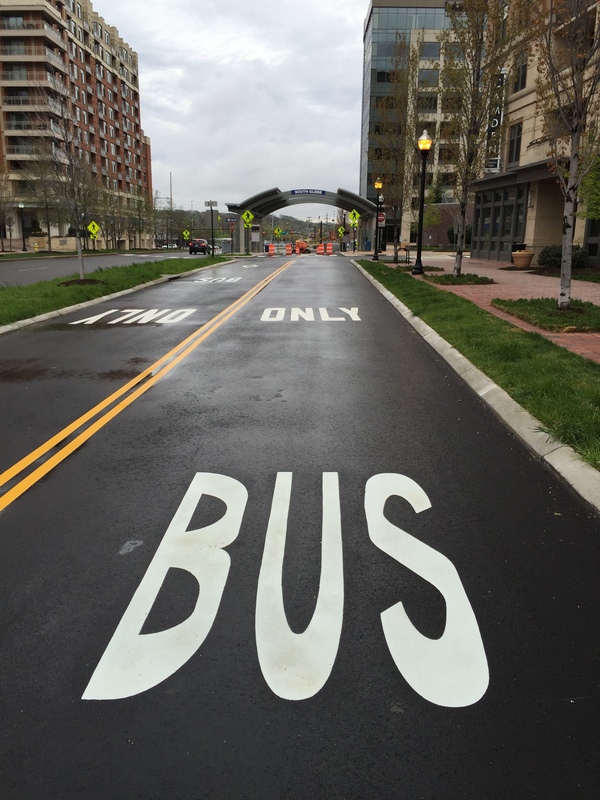 In April 2016, Arlington opened dedicated bus lanes in Crystal City and Potomac Yard. The lanes provide faster, more reliable trips for bus riders along the Route 1 corridor. 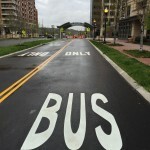 Arlington plans to extend these bus lanes to Pentagon City. In January 2016 the County Board approved an ordinance establishing the rules for how the new bus-only lanes are used and enforced. Details are below. 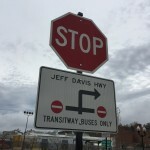 Weekdays between 6 and 9 a.m. and 3:30 and 7 p.m.
Illuminated signs above the lane and signage along the street will indicate when the bus-only restriction is in force. Alongside South Glebe Road, Route 1 and Crystal Drive up to 26th Street. These newly built lanes are separated from general traffic by a curb. Signage at intersections will note these restrictions. Examples are below. Select an image to see the full-size version. How do I identify a bus lane – what markings does it have? The rush hour bus lane in Crystal City is marked with diamond-shaped symbols on the pavement, as well as signs along the street and on overhead supports. 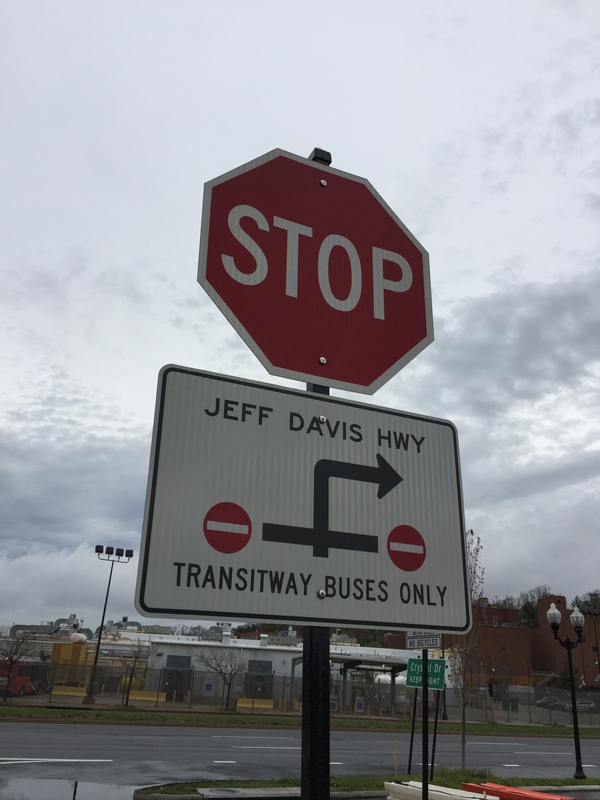 The exclusive bus-only roadway in Potomac Yard is marked with diamond-shaped symbols on the pavement, the words “Bus Only” on the pavement, and “Do Not Enter” signs at all intersections. What transit vehicles are allowed to use the bus lanes? 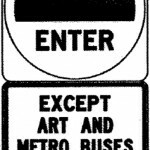 The bus lanes will be used by WMATA’s Metroway service, Metrobuses and Arlington’s ART buses. Can emergency vehicles use the bus lanes? Yes, emergency vehicles – ambulances, fire trucks, etc. – are allowed to use the bus lanes at all times. Will I be fined for driving in the bus-only lane? The County Board established a fine of $200, as allowed by state law, for violators of the bus-only lanes. This fine will not apply to drivers who use the rush hour bus-only lane to make a right turn at a corner or into a driveway. 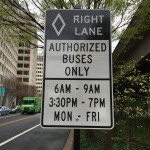 After the bus-only lanes opened on April 17, enforcement of the rules began with a transition period of 30 days, during which Arlington County Police will issue warnings and no fines will be imposed. As a driver, how do I make a right turn using the rush hour bus-only lane? A dashed lane marking indicates where you can enter the lane prior to a corner or driveway. Be sure to signal and safely enter as you are nearing your turn. Yield to oncoming buses before entering the lane. If I am exiting a driveway next to the bus lane, can I use the bus lane to merge into general traffic? Yes. 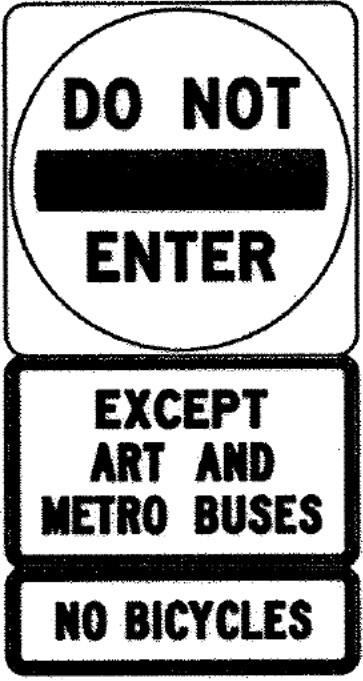 Drivers may exit the driveway into the bus lane and then safely merge into the general traffic lane. Can I use the bus lane as a passing lane? Drivers may not use the bus-only lane as a passing lane during the times (weekdays between 6 and 9 a.m. and 3:30 and 7 p.m.) when the bus-only restriction is in force. During these rush hour time periods, other vehicles may enter the bus lane only to make a right turn at the next corner or driveway. Can cyclists use the bus lanes? Cyclists may not use the bus lane where a dedicated bike lane exists. There is a bike lane adjacent to the bus lane on southbound Clark Street between 20th and 26th Streets and on northbound Crystal Drive between 23rd and 15th Streets. 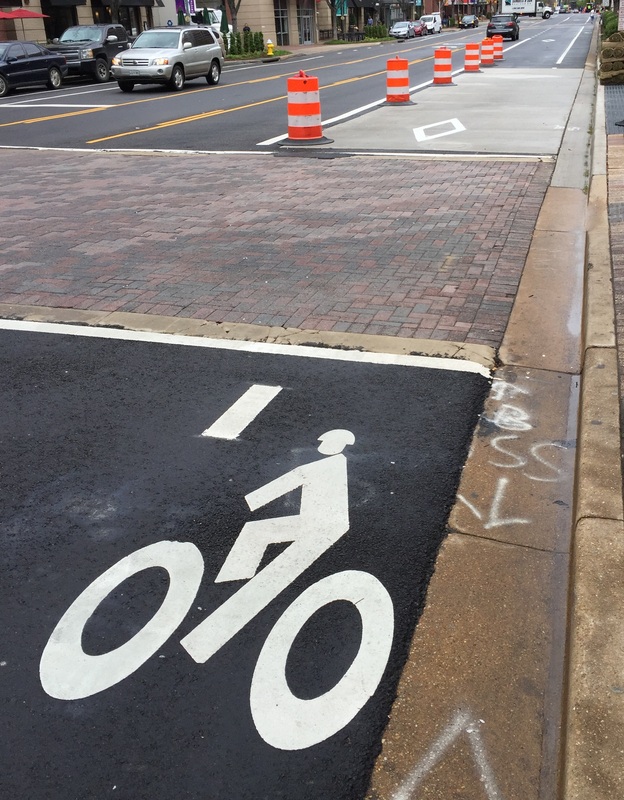 Cyclists are also not allowed in the exclusive bus lanes in Potomac Yard, which are dedicated to buses 24 hours-a-day, 7 days-a-week. 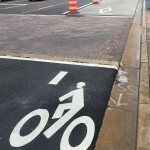 Instead, riders should use the side path next to the bus-only lanes, or use the bike lanes on Potomac Avenue. Can drivers picking up sluggers use the bus lanes? No. Sluggers are carpoolers who catch rides with drivers looking to add passengers in order to meet the HOV requirement along I-66, I-95 and I-395, but carpool vehicles are not allowed to use the bus lanes. 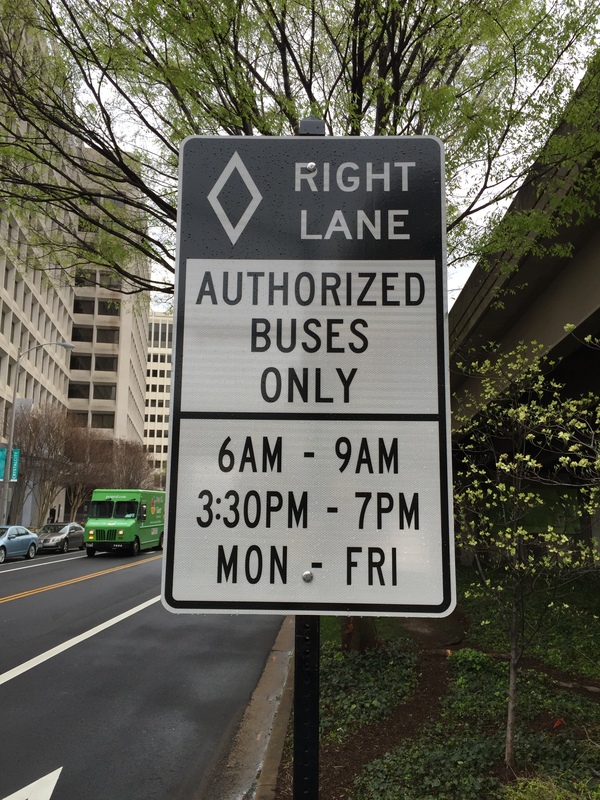 In Crystal City, the slug line location is at 1200 Crystal Drive, which is outside the area of the bus lanes, so sluggers should not be affected by the bus-only lane restrictions. Can taxis or Uber/Lyft vehicles use the bus lanes? These companies are subject to the same rules and fines as other drivers. During rush hour time periods, taxis and Uber/Lyft vehicles may enter the bus lane only to make a right turn at the next corner or driveway. How were the hours determined for the rush hour bus lane? The County determined the hours for the rush hour bus-only lane by analyzing traffic volumes and the frequency of bus service. During 2015, County staff had conversations with Crystal City residents and the business community about the proposed restrictions, and how general traffic – including turn movements – would be accommodated. In response to community feedback, staff reduced the hours of the rush hour lane restrictions from 10 hours per weekday to 6.5 hours per weekday.